Challenge 43-Colour Challenge-Turquoise, Heavenly Blue, Yellow, Hot Pink, she had a sketch there with her colors, so I hope it's o.k. that I used this other sketch. 2 cards to go to meet my personal posting goal today. Supplies: Card Blank 6" X 6" Square from 12" X 12" piece of textured card stock, yellow, turquoise, and white from my scrap box, Ink: CTMH-Z2167 Creme Brulee, hot pink paper-ColorBok Punch-Out Pack Bright, Stamp: Stampendous Clear Stamp-SSC039 Window Box Set, Fiskars Corner and Emboss punch, ColorBok-pink metal hearts, Bead Party-Bling!Bling! adhesive flowers, Darice-self-stick flower gems, Sharpie pens-Blue, Fushia, American Crafts Elements ribbon-Cupcake. 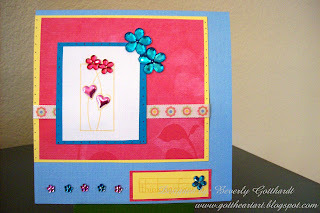 Gorgeous card and I love your layout. Thanks for joining us this week.